Chichester residents have been asked to avoid using any tip sites following a fire at the Household Waste Recycling centre last night. 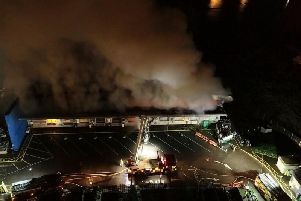 A West Sussex Fire and Rescue Service spokesman said: "Fire crews were alerted to a fire at the site at 8:25pm on Tuesday, April 2. On arrival, crews found a developing fire in the main building of the centre. 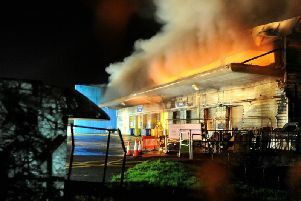 "At the height of the fire four fire engines and the aerial ladder platform were at the scene. Crews remained on the scene overnight and in to today. The cause of the fire is unknown and there have been no reported injuries." A county council spokesman said that, following consultation with the Environment Agency, it was decided to allow the fire to burn 'in a controlled way' and not use water, 'in order to prevent pollution to local water courses'. This is being kept under 'close review'. The county council advised that the Westhampnett Household Waste and Recycling site is closed for the 'next few days at least'. The spokesman added: "We ask residents in the Chichester area to avoid using any site if possible in the meantime [but] if necessary, the nearest alternative sites are Bognor Regis, which will be open seven days a week for the time being, Worthing, Billingshurst and Littlehampton. Please note Bognor [and Littlehampton are] not able to accept trailers. "For more information about West Sussex household waste and recycling centres, please visit http://www.recycleforwestsussex.org/recycling-sites/"
When asked if waste collections would be affected, Chichester District Council said 'everything is continuing as normal'.